About Face Theatre’s Youth Task force is collaborating with Salonathon to curate an ALL-AGES evening of genre-defying performances! The goal of this evening is to provide an opportunity for young artists to further explore their art in a safe and comfortable environment. This event is FREE. Come early to enjoy some refreshments and to grab a spot. As always, we’re gonna have those sweet sweet beats from DJ SWAGUERRILLA! SALONATHON is a home for underground, emerging & genre-defying art. Founded by Jane Beachy in July 2011, Salonathon takes place every Monday night at Beauty Bar, and Salonathon Presents produces one-off events and performance parties all around town. 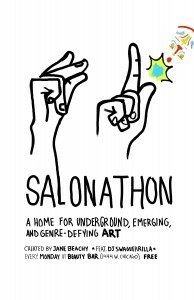 Salonathon is an engine for experimental work, an inclusive creative community, and a great party. ABOUT FACE THEATRE‘s mission is to enhance the dialogue on gender and sexual identity, and its youth task force is a group of young adults in the About Face Youth Ensemble working to create community programming for other Chicago youth.